I couldn’t be more excited about today’s post! I get to combine 2 of my favorite topics…. tailgating and chili!! We love to tailgate at football games and have been testing out all kinds of different recipes for years. What could possibly make a better Saturday? There’s not much I can think of! We meet up with some great friends, bring our grills, and get to cooking! I mean, the food is almost as important as the game and is something to be carefully considered. We usually start planning several days to a week in advance so we can do any necessary shopping and prep work so that our time spent in the parking lot before the game can be maximum fun and relaxation. 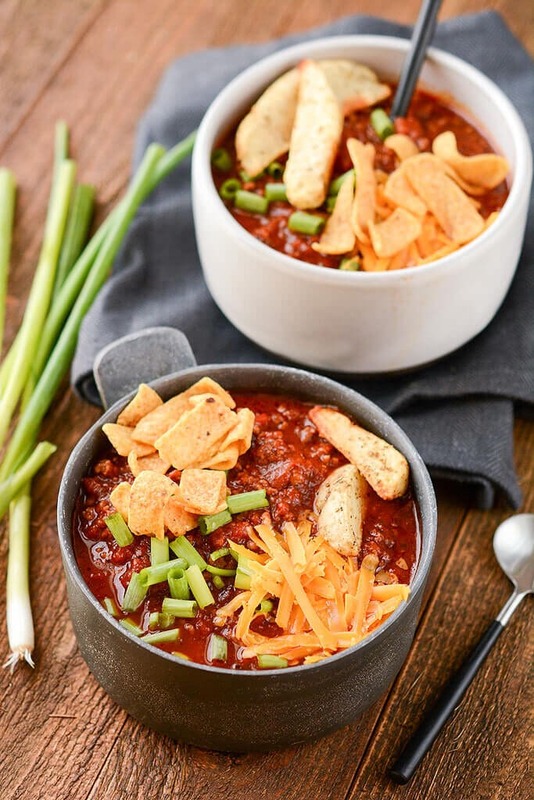 I can assure you we have tried and enjoyed many types of chili recipes over the years. Anything from recipes we’ve made completely ahead of time to those we’ve made totally in the moment. This year, I got to thinking, what if I could find something that work well and makes the best of both worlds. All of the ingredients could be added together in a bag and then the contents could be heated at game-time (so to speak). 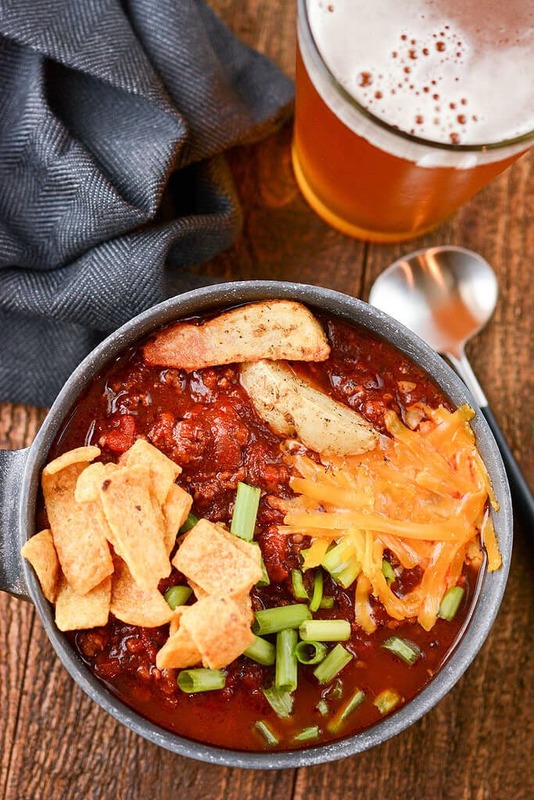 So what goes into making this tailgate chili? 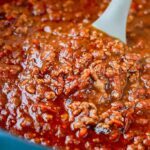 I wanted a recipe to simulate the smokiness of a chili that’s been on the campfire all day but be a meal that would come together quickly. Therefore, I used all the smoky ingredients I could think of. Fire-roasted tomatoes, plenty of cumin, roasted garlic powder and ancho chili powder. I chose a ground beef and pork as the base but you could use chicken or turkey as well. The one thing noticeably missing? That’s right, beans. I did that for a reason. How should I say this? Beans just don’t always agree with everyone, and who wants to sit around at the game with their tummy in a rumble. Leave the beans out and enjoy this chili without concern! 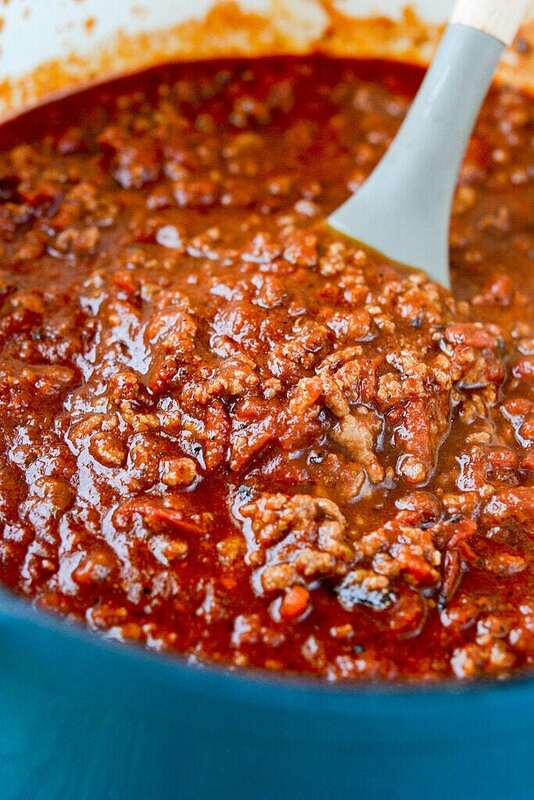 What goes well with chili? shall we just take a moment to talk about the toppings. To me, this is so much of what chili is about. You can make the same recipe but alter all of the options to dress it up so that it’s different every time. We love to pour it over baked potatoes or load it up with crispy potato wedges. Fill it up with corn chips if that’s your style. And, obviously, cheese. Maybe some sour cream? Start dreaming it up and I’ll bet it will go! and of course, what tailgate would be complete without your favorite beverage. An ice cold beer perhaps? I also added a couple of secret ingredients I’m about to share with you! Beer (in the chili!) is the first, and probably not terribly surprising, but certainly a way to customize the flavor. The second? Chocolate powder!! That’s right, just a little, but it’s there. It will cut the acidity and give a richness to the chili that can’t be left out. Our favorite essential tailgating supplies when making chili you ask? I can’t find some of these chili powders do you have any substitutions I can use like for the Chipotle chili powder and for the anchor chili powder? Hi Karen! 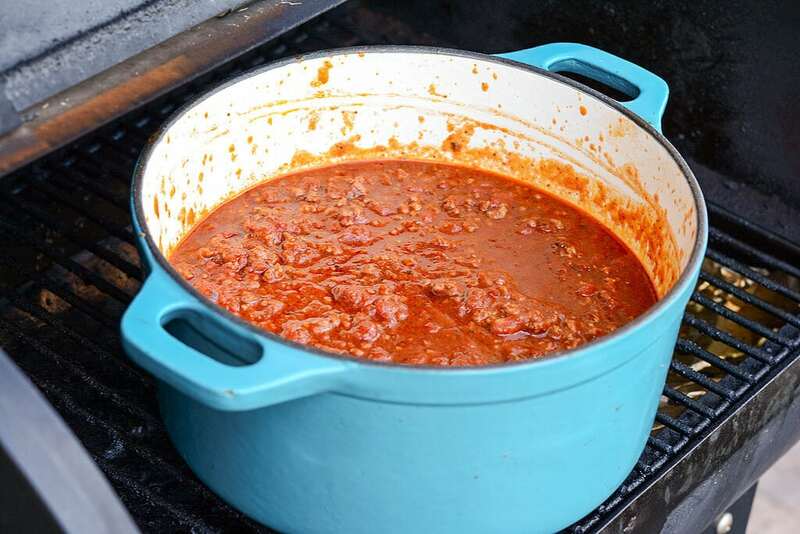 You could use regular chili powder, but you will miss out on the added flavor with the smokiness and the bit of spice. You can always order them from Amazon.com!! Everybody liked it! Even my picky 8 yr old. We served it with Fritos. 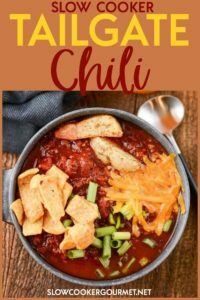 I finally found a chili recipe I like. The only thing I changed was the beer for beef broth. Thank you!! Why beer as an ingredient? I have celiac disease, and i don’t like the taste of GF beer, not sure if I want to add it to the chili. Is there a substitute that you recommend? 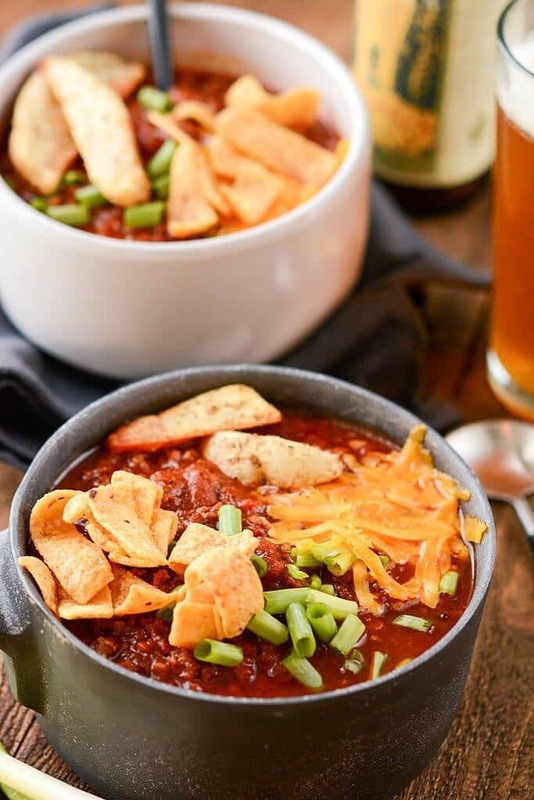 Beer is a delicious addition to add flavor and complexity to chili :). But, if you don’t like it, you can certainly sub out for broth. What kind of beer is best..? Is the chocolate powder unsweetened cocoa?? Can I use only ground beef? One more thing I like about this recipe is the chocolate powder! Honestly, I’ve never tried to use a sweet powder for a salty dish like this. Cannot wait to try this! What size cans for the tomatoes? 26 oz. I use 2 cans. What size are the cans of fire-roasted crushed tomatoes?